First Lieutenant Starck was the pilot of a F-80C Shooting Star fighter interceptor with the 9th Fighter Bomber Squadron, 49th Fighter Bomber Group. On July 18, 1951, while on a combat mission, his aircraft received a direct hit by anti-aircraft fire two miles west of Unhung-ni, Korea. Because of the aircraft's low altitude, his attempt to eject was unsuccessful. He was listed as Missing in Action and was presumed dead on March 31, 1954. 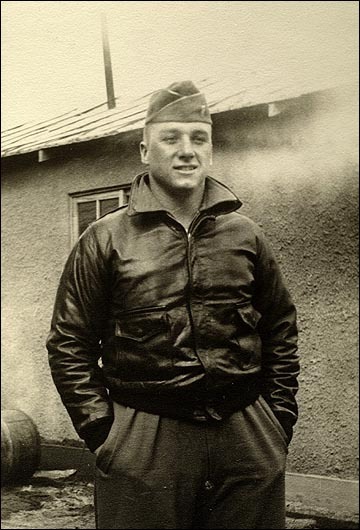 For his leadership and valor, First Lieutenant Starck was awarded the Distinguished Flying Cross, the Air Medal with Oak Leaf Cluster, the Purple Heart, the Korean Service Medal, the United Nations Service Medal, the National Defense Service Medal, the Korean Presidential Unit Citation and the Republic of Korea War Service Medal. The story is more than 50 years old, but it's one Shirley Ruder will never forget. She's still waiting for the ending. Ruder was told about John Shirley Starck, a Lieutenant in the U.S. Air Force, from the time she was a small child. Her mother married the young pilot in 1950, just months before he was called to fight in the Korean War. "I guess when I was real young I knew all about him," Ruder said. "My mother told me a story about a man that went away to war and never came home." Ruder was 9 years old when her mother told her the pilot in the story was her father. She was born two months after Starck's F-80 jet went down over North Korea in 1951 and he was declared missing. Ruder is now 54 and an assistant nursing professor at Florida Gulf Coast University. She is still looking for answers about her father's death. "I think we would like to have closure," Ruder said. "It would be nice to know, but I'm not really expecting it." Her family is among the thousands that receive regular updates from the U.S. Department of Defense on the government's efforts to locate the remains of U.S. servicemen who went missing during the Korean War. The military declared Ruder's father dead in 1954, three years after his plane went down, but his body was never recovered. "Of course in the back of our minds we hope he was dead to tell you the truth," Ruder said. "You hate to think that all this time he was tortured or sent to another country, or whatever it is they did to them." Ruder said she began to receive summaries on the government's efforts to locate the remains about 10 years ago. "I think the positive thing is we've seen the government really step up and take a lot more action now and work with families," Ruder said. "We didn't see that for years." The conflict between North Korea and South Korea ended July 27, 1953. More than 8,000 U.S. servicemen were declared missing or prisoners of war in its aftermath. Since 1996, the military has been able to recover the remains of 225 of those servicemen in operations in North Korea, said Larry Greer, a spokesman for the U.S. Department of Defense's POW/MIA personnel office. Records from the U.S. Department of Defense show 163 Florida residents are among those still missing. The names of six soldiers from Lee and Collier counties are included in an online data base used by the Department of Defense to find family members and potential DNA donors to help identify remains. The Korean War Project is a site compiled by brothers Hal and Ted Barker in Dallas, Texas, and based on records from the Department of Defense. The site lists servicemen by state, territory and county and names are flagged if DNA is still needed to identify the soldier's remains. "They have provided a wealth of research that's very useful for us," Greer said. Donating DNA is more important than ever as the United States makes progress in recovering the remains of U.S. soldiers from Korea. The Department of Defense still needs DNA samples from family members of more than 4,800 soldiers. "It's possible that the blood drop they leave behind may be the evidence needed to identify their loved one," Greer said. The military has been using DNA samples to identify the remains of U.S. soldiers since 1994. Before that, soldiers were identified through evidence such as dental X-rays. Samples from potential family members through blood samples or a mouth swab of saliva have proven to be extremely effective, Greer said. "We are using this technique in about 80 percent of the IDs we've been making in the past couple of years," Greer said. Ruder said her cousin has donated the DNA necessary to identify her father's remains if they are found. "For my whole life, I'll always wonder what really happened," Ruder said. "I'll probably always wonder if my father is dead." After contacting a public casualty officer with the U.S. Air Force, Ruder received a 1-inch file that included copies of her father's military physicals and records of his flights. "It was a lot of stuff we didn't have," she said. The family has placed a memorial stone at Arlington National Cemetery in Virginia. Ruder reads the letters her mother and father wrote to each other. Her 18-year-old son was named in honor of the grandfather he'll never meet. Her mother, Celia, 73, clings to the hope that her husband's body will one day be found. "My mother's never really gotten over my father," Ruder said. "She was 19 years old and madly in love. He was the love of her life."